Indet Regular leaf. 95 days. 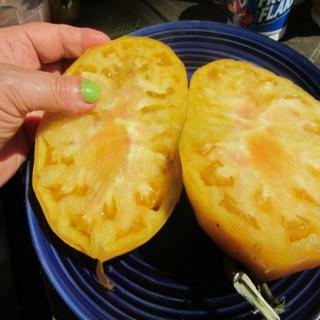 This is one of the largest Bicolor tomatoes I have seen. Rampant production with excellent sweet taste this one is better than most other bicolors flavor wise. 4 lbs and above were the norm on this one. Needs support the regular thin wire cages common at most garden supplies just will not be strong enough. Your results may vary according to your conditions.